Its been a while since I painted on canvas – especially on this scale. This piece measures 20×30 and I titled it Smells of Nature. I began this painting by laying down many layers of acrylics in different earth tones. I thinned the paint allowing it to drip and run down the canvas vertically. Then I worked on the overlay image. I started with the buck with its rack separated from the skull. 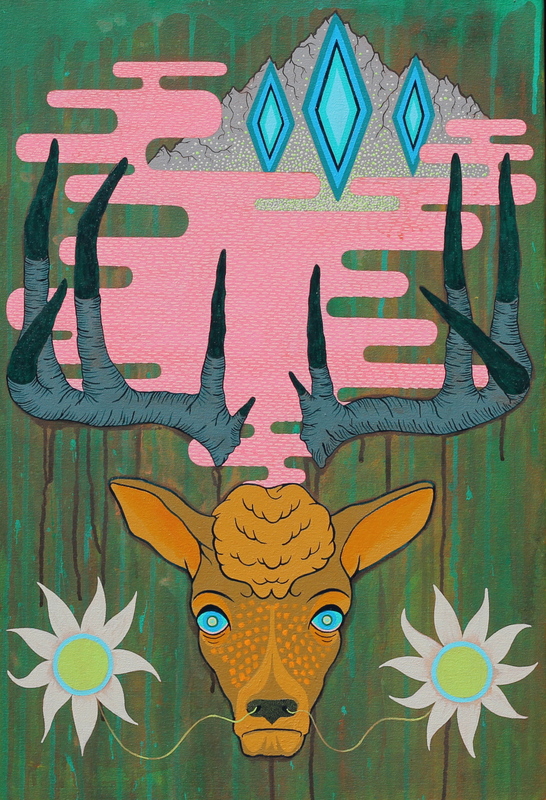 Then I added in the pink pattern behind the horns followed by the mountain range with the three diamonds. Finally, I added the flowers at the bottom to help balance out everything that was going on at the top and connected them to the buck by tiny threads from the nostrils. This painting was a labor of love. I have a lot of time and energy in this one and I wouldn’t say this one came easy to me. It seemed like I spent just as much time thinking about the composition as I did painting. While some of the elements might look random and disconnected, they didn’t come about haphazardly. In the end, I feel like I created something that comments on the wild and the predictable, the young and the old, the fragile and the everlasting. The colors and the patterns turned out exactly as I intended, but the thing I like most about this artwork is its wholeness. The way every element is balanced by another and especially the way that every element is connected, much like everything else in life. Great shapes and color in this one. I especially love that pink in the middle.